Dr. Claudia Dumschat leading the Church Choir. Photo by Tatyana Pantano. On the evening of Friday, June 9th at the Church of the Transfiguration (also known as The Little Church Around the Corner) on 29th Street in New York City, there was a performance of Modern Masterpieces, a memorial concert to Arnold Schwartz (1905-1979), patron and benefactor. Schwartz was born in Brooklyn and together with his wife Marie were acclaimed for their generous donations to the arts. The magnificent church organ was donated by his wife and named in his memory. Dr. Claudia Dumschat, organist and music director of the Church of the transfiguration, planned a most ambitious and enlightening program for this concert, which included the Transfiguration Choir of Men and Boys, Girls Choir and Camerata plus the excellent Transfiguration Instrumental Ensemble, consisting of Joy Plaisted on the harp, James Kennerley at the organ and Jared Soldiviero on the timpani. The great conductor composer Leonard Bernstein (1918-1990) worked with the Transfiguration Boys Choir in 1961. 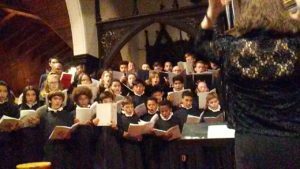 At that time, the choir sang and traveled extensively with some of the musical giants of that era. Opening remarks were made by the newly appointed and youthful Rev. Father John David van Dooren. 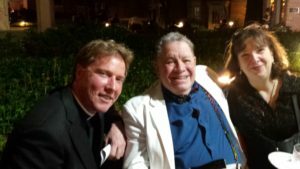 Father van Dooren, a man who cherishes the importance of music and culture in our lives, cordially welcomed one and all to this musical celebration. The program opened with “Rejoice in the Lamb” by British composer Benjamin Britten (1913-1976) is based on the poem “Jubilate Agno” by Christopher Smart, who was a mad poet often institutionalized. This poem is about cat and mouse. “My Cat Jeoffry” – a precursor to “Cats”? The libretto rejoices in the beauty of his cat Jeoffry and his female mouse and all of creation. “Rejoice in the lamb” was sung by Enlun Yin soprano, Joe Redd alto, Ben Thomas tenor and Alan Henriquez baritone, accompanied by the Transfiguration Choir of Men and Boys, and made for a delightful treat to Britten’s haunting, unique and flowing output. Soloist Luciano Pantano. Photo by Tatyana Pantano. Three Ave Maria settings followed. Everyone is familiar with Ave Maria by Franz Schubert or the Bach-Gounod transcriptions by Leopold Stokowski, but there are many others. Enrico Caruso recorded an Ave Maria by Percy Kahn in 1913 with Mischa Elman on the violin. Giuseppe Verdi composed a beautiful Ave Maria for Desdemona in his late masterpiece “Otello” (1887). Vladimir Vavilov, using notes supposedly from Giulio Caccini (1551-1616), wrote an Ave Maria in 1970 of poignant tranquility. Composer Bill Heigen, who sang with the Choir years ago, wrote an Ave Maria. The Transfiguration Girls Choir sang this with great reverence. The soft singing made one look at the beautiful grotto in the church devoted to Mary. Heigen dedicated this piece to the choir. The Ave Maria by Franz Beibl rounded out this trio, sung “a capella” by the gentlemen of the choir in a robust, solemn and praiseworthy manner, evoking the a capella group “All The Kings Men”. Ms.Claudia Dumschat led these ascending prayers with a steady hand. The harp of Joy Plaisted made the earthbound audience become heaven bound and on the side of the angels. The second part of the program began with soprano Sara Paar accompanied on the piano by Anabelinda de Castro in a series of Leonard Bernstein songs entitled “I Hate Music!”. In “My Name is Barbara,” a little girl seeks recognition despite her young age, saucily and defiantly sung in a strong soubrette soprano. “Jupiter Has Seven Moons,” “I Hate Music” and “I’m a Person Too” are some of the sprightly tunes that evoked the insouciance of “I Feel Pretty” from Bernstein’s masterpiece West Side Story. Ms. Paar, will be without peer in such roles as Nannetta in Verdi’s Falstaff and other roles in the lyric repertory. Ms. Paar is both beguiling and enchanting! Anabelinda de Castro was her sprightly and dexterous accompanist. Rev. Father John David Van Dooren, Nino Pantano & Dr. Claudia Dumschat. Photo by Judy Pantano. Joe Redd, alto, sang “A Simple Song” from Bernstein’s “Mass” which was written to honor the slain President John F. Kennedy, whose birth centenary we celebrate this year. Mr. Redd has a warm amber quality to his flexible voice and he negotiated the vocal terrain smoothly. In early December 1963, Leonard Bernstein received a letter from the Very Reverend Walter H. Hussey, Dean of the Cathedral in Chichester in Sussex, England requesting a composition for the Cathedral’s 1965 music festival involving the setting of Psalm Two, answering the question “why do the nations rage?” From the time of Chichester Psalms sold out world premiere at Philharmonic Hall in New York City on July 15th, 1965, it was apparent that Bernstein had created a magically unique blend of biblical Hebrew verse and Christian choral tradition – a musical depiction of the composer’s hope for brotherhood and peace. From “Make a Joyful Noise Unto the Lord” to “The Lord is My Shepard,” this piece, both jazzy and traditional, has old-fashioned sweetness and more than a touch of brashness. Chichester Psalms is more akin to Carl Orff’s Carmina Burana than to Verdi’s Requiem, yet like a pigeon and a dinosaur, they are part of the evolution of musical sound. The singers were Luciano Pantano treble, Christina Kay soprano, Tessoro Estrella soprano, Joe Redd alto, Ben Thomas tenor and Alan Henriquez baritone. All of them worked so hard to make it look easy. 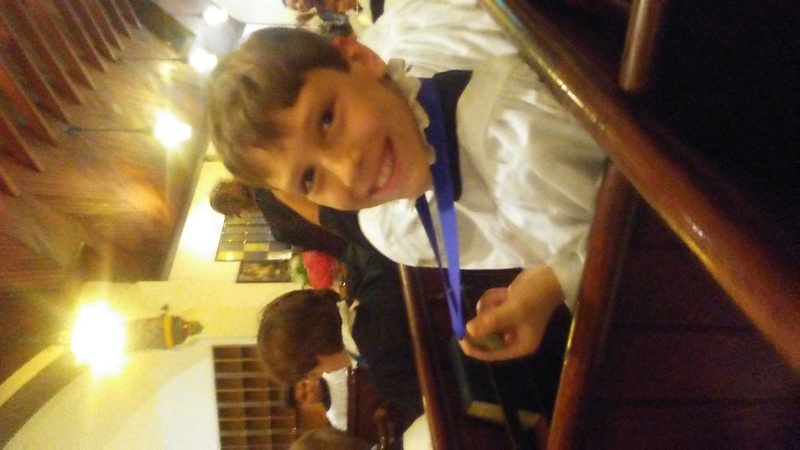 My grandson Luciano Pantano used his boy treble fearlessly and his voice rang out loud and clear in his solo as he sang in Hebrew in Chichester Psalms – Movement 11 (Psalm 23 and 2:1-4). 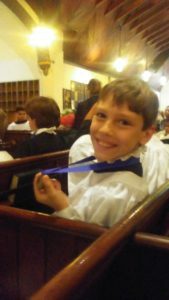 We are very proud of him and his sister Leeza, who sings in the Girls Choir and is also a treble. Dr. Claudia Dumschat & Lubov Klitsenko. Dr. Claudia Dumschat was truly the Maestro Supreme, conjuring up all the power and majesty of this great work. The superb organist James Kennerley made his instrument sing and soar! I thought of the great Dr. Albert Schweitzer (1875-1965) playing his organ in the jungles of Lambaréné in Gabon, Africa on his mission to humanity. Joy Plaisted on the heavenly harp brought back memories of our mutual friend, the late beloved harp master Dulcie Barlow. Chichester Psalms is a work of gentle fierceness and a plea for peace. It combines the old testament of righteousness and the new, of mercy. Leonard Bernstein is buried not far from our home in Greenwood Cemetery in Brooklyn. It is said that when Bernstein’s funeral procession arrived for the burial, the working crews in the streets of Brooklyn applauded in tribute. The large audience also applauded this work from Leonard Bernstein. The reception afterwards in the courtyard ensured us of good conversation, food and libation. We were happy to “meet and greet” Dr. Claudia Dumschat, Rev. Father John David van Dooren, who expressed his enthusiasm for such evenings as this, Stage Director (Amahl) Richard Olson, the singers, musicians and all. Our son Marcello, his wife Tatyana, her parents from Omsk, Russia, Nikolay and Lubov Klitsenko were all there to listen and reap praise. Nikolay is a bayan (Russian accordion) master, Lubov, a choral director at their school in Russia, and their daughter Tatyana was also a chorus conductor. 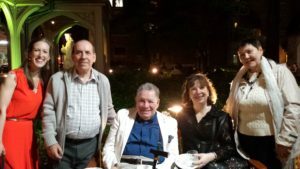 Our son Marcello plays the drums, my wife Judy sang in school choirs and I was “The Boy Caruso of Brooklyn”- is it any wonder there’s a song in our hearts? On the grave of the great English American Maestro Leopold Stokowski, a Bach expert and pioneer of American music (1882-1977) (Fantasia), is the inscription “Music is the Voice of the All.” Some thought this might have been a misprint but Maestro Stokowski, whose long career began at St. Bartholomew Church in 1905 as an organist and choirmaster in New York, is correct. It was something he would have thought universal and proper. We all applaud Maestro Dr. Claudia Dumschat, music director and organist, for this special splendid evening on a warm, balmy June night and thank her for reminding us so magnificently that “music IS the voice of the all”!